(bAlanAy) AzhwAr after having desired to enjoy with such emperumAn who is the ultimate goal and not having achieved the same, due to infinite agony, [in feminine mood] reveals her crying through the words of some one else [her mother]”. In second decad, AzhwAr meditates upon the defects of other goals (such as worldly pleasure, self-enjoyment) and the distinguished nature of bhagavAn, desires to unite with the ultimately enjoyable emperumAn – but becomes very sad due to not achieving the same. The longing which he had in thiruvAimozhi 3.8 “mudiyAnE” got subdued in other aspects, rises again in AzhwAr and as he greatly desires to enjoy emperumAn’s aspects of various times and places, yet he does not get those desires fulfilled and becomes unconscious. AzhwAr, assuming the mood of the mother of a pirAtti [consort of emperumAn] who is suffering in separation from emperumAn, informs emperumAn, the sadness of the relatives who observe the pathetic state of such pirAtti. Meditating upon these, AzhwAr, explains the words of care-takers who would reveal to the on-lookers about the person whom they cared for, when such person [whom they cared for] has great fondness towards thiruththuzhAy (thuLasi) which reveals the enjoyable nature of the divine feet of sarvESvaran. In this case, he explains it as a mother of a consort who is in separation from emperumAn, would speak about the agony of her daughter to those who enquired about the same. 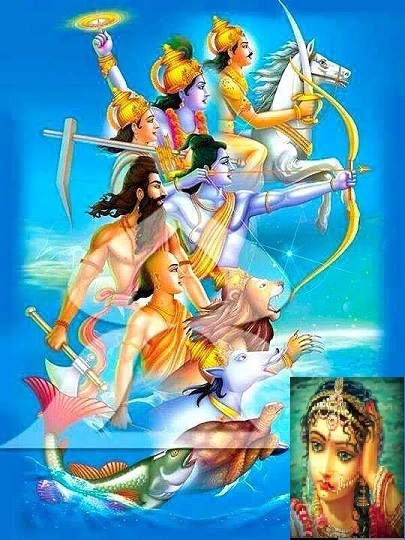 Like the residents of thiruvayOdhyai (ayOdhyA) cried out in separation of SrI rAma, AzhwAr too cried out along with his sensory organs with great agony in thiruvAimozhi 3.8 “mudiyAnE“; in thiruvAimozhi 3.9 “sonnAl virOdham“, AzhwAr saw that others are crying out (like he does) for lowly goals and thought “Alas! they are not crying out for bhagavAn” and then felt satisfied that at least he himself was crying out for bhagavAn; in thiruvAimozhi 3.10 “sanmam palapala“, he felt happy thinking “Did it stop with that [crying out]? we also got senses which are solely existing for bhagavAn; in thiruvAimozhi 4.1 “orunAyagamAy“, he saw that those others are letting their senses go astray and facing a disaster due to their attachment to aiSwaryam (worldly pleasures) and kaivalyam (self-enjoyment), instructed the defects such as insignificance and impermanence of such other goals and how emperumAn remains the ultimate goal to be achieved and thus “give up the other goals and hold on to bhagavAn”. Incidentally [deviating from the main topic], nampiLLai would mercifully say “the same nammAzhwAr who spoke the ‘oru nAyagam‘ decad, spoke thiruvAimozhi 10.9 ‘sUzh visumbaNi mugil‘ decad as well. SrIvaishNavas should behold this thought in their divine heart”. That is, – just like AzhwAr was able to visualize this [lowly nature of worldly pleasures and self-enjoyment, sitting under the divine tamarind tree without having travelled anywhere], after shedding the body, one would see that [sUzh visumbaNi mugil decad describes the journey of the soul to SrIvaikuNtam through the archirAdhi mArgam] too. Thus AzhwAr explains here – in these three decads, the instruction of AzhwAr instead of helping reform samsAris (worldly people), helped AzhwAr himself to acquire craving for bhagavAn. That is, AzhwAr first meditated upon the defective nature of worldly pleasures and then meditated upon bhagavAn’s greatness and said “Hold on to bhagavAn; give up worldly pleasures”; such meditation instead of helping others, helped AzhwAr himself acquiring clarity on this principle; as in the case of SrI vibhIshaNAzhwAn’s good instructions to rAvaNa helped himself surrendering to perumAL (SrI rAma) instead of helping rAvaNa and in the case of SrI prahlAdhAzhwAn’s good instructions to hiraNya did not bring in any change in hiraNya’s heart but increased his own devotion towards bhagavAn, here too, AzhwAr’s good instructions towards others in “vIdumin muRRa“, “sonnAl virOdham” and “orunAyagam” helped AzhwAr instead of helping samsAris. That is, as the crop will grow multi-fold when the weeds are removed thrice and chaff (empty grain which resembles real paddy) is eliminated, his attachment towards bhagavAn became multi-fold. For them (devotees), kaLai (weed) is any pleasure other than bhagavAn, serving inappropriate persons and considering aiSwaryam (worldly pleasure) and kaivalyam (self-enjoyment) as goal; sangAyam (chaff) – that which exists in the crop, and for those who are unaware, it will make them think it to be paddy and when it is not removed, it will spoil the whole crop – kaivalyam works the same way too. While this attachment was previously existing in AzhwAr, the longing which he had in thiruvAimozhi 3.8 “mudiyAnE” got subdued in other aspects [such as aiSwaryam, kaivalyam]; [subsequently] that longing arose in AzhwAr and he further longed to enjoy emperumAn’s wondrous activities/forms of different places and times right here and right now; since that desire was not fulfilled led to a different state for AzhwAr. That is – AzhwAr revealing his state of being a pirAtti (consort of emperumAn) who separated from sarvESvaran after being together with him, becomes unconscious/bewildered; her mother sees her and speaks her state as “my daughter desires to enjoy emperumAn’s activities/forms from different places and times right here and right now”. [How can one desire for historic events to reoccur? That is because of the greatness of the person who performed such events] When bhImasEna saw thiruvadi (hanuman), realizing the power of hanuman, bhIma said in mahAbhAratham “sAgaram tharthumudhyuktham rUpa prathimam mahath | dhrashtum ichchAmi” (I want to see your form which tried to cross over the ocean by jumping across and which is incomparable), desiring to see hanuman’s form. Similarly, since parAnkuSa nAyaki (nammAzhwAr in feminine mood) knows the power of bhagavAn, her own attachment to get the result, and due to her great love, wanted to enjoy the activities which happened in the past, immediately. This entry was posted in thiruvAimozhi, thiruvAimozhi 4th centum on November 29, 2016 by Sarathy Thothathri.